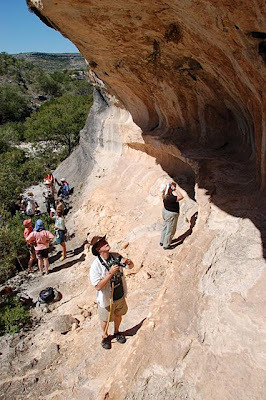 There is well-documented archaeological evidence indicating prehistoric peyote use, including pictographs and ancient peyote specimens found in caves and rock shelters in the lower Pecos River region of Texas. Anthropologist and archaeologist Dr. Carolyn E. Boyd has argued that the Lower Pecos pictographs provide the earliest record of peyotism. 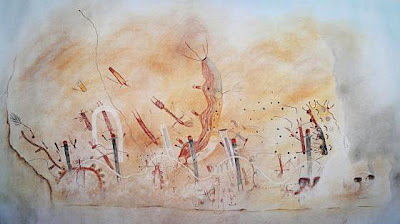 The above picture is Carolyn Boyd's rendering of the murals at the White Shaman site. The original rock art panel is high on a bluff overlooking the Pecos River. According to Boyd it depicts the hunt for sacred peyote, a powerful medicinal and sacramental plant. She also interprets it as a ritual re-enactment of the first pilgrimage that led to the birth of gods, the establishment of the seasons and the creation of the cosmos. The following snippet of text is taken from a recent article on the pictographs at the Mystic Shelter site. Boyd thinks these murals were inspired by visions the people experienced during trances brought on by the hallucinogen peyote. Some depict a warrior's journey to the "Otherworld." Some describe the hunt for the sacred peyote cactus and how the cosmos was put into place. "The rock art panels are pictorial narratives of mytho-historical events - like putting the Old Testament creation story or Passover rituals into a visual format rather than textual," Boyd says. The artists were hunter-gatherers, and lived in an extremely arid environment where deer were prized. Yet they used valuable fat from deer bones to make paint, illustrating the importance of the artwork in their culture, Boyd says. The murals - explosions of orange, red, yellow and black - would have jumped out from the daily landscape of brown, green and gray. "It must have been spectacular," she says. "Can you imagine the impact that would have? The record is still in the rock. Surviving murals are found in rock shelters throughout the Lower Pecos region, where they were protected from rain, sun and wind. According to radiocarbon dating, most, including the ones at Mystic Shelter, were made 2,950 to 4,200 years ago. More sites are still being discovered. If you (like me;-) dream of having a closer look at the pictographs the Shumla School arranges rock art field trips allowing you to examine the incredible imagery at first hand. Shumla School participants investigating the pictographs at Mystic Shelter, one of Texas's best sites for prehistoric art. this is very very interesting! So man has been getting stoned for as long as we can remember. but since we've been stoned we can't remember that long. my name is Martin from slovakia. webpage is very nice and interesting. taxon lophophora as divided ? Lophophora williamsii c.v. "togeu batama"
Hi Martin, the taxonomy of Lophophora is quite messy and in dire need of a revision/clarification. Personally I would stick to a more conservative classification including only Lophophora diffusa, L. fricii, L. koehresii, and L. williamsii as good species - possibly also including the newly described Lophophora alberto-vojtechii but I would like to see some more data on that species. Also, preliminary results by Martin Terry suggest that the northern form of L. williamsii (usually known as Lophophora williamsii var. echinata) is distinct from the typical southern form, Lophophora williamsii var. williamsii. The rest of the names on your list I consider cultivar names (of course one can always discuss whether Lophophora diffusa var. koehresii or Lophophora koehresii is the correct moniker).